Guy Dirkin's letter on Malaga facilities is specific and prescriptive. Guy wants better WMA oversight of LOCs. Guy Dirkin of Florida had a good Malaga. As an M65 thrower, competing for Britain, he won silver in the hammer and was 23 points away from bronze in the throws pentathlon. 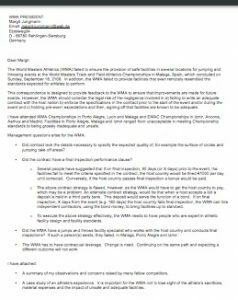 But he wasn’t happy with the facilities and let the new WMA president know in a letter I obtained. In a four-page letter, he cited the example of an American W55 high jumper. He didn’t name her, but it apparently was fellow Orlando area athlete Jo Phelps, whose 1.24 (4-0 3/4) jump at worlds was seventh — far off her season best of 1.35 meters (4-5). The rotten, crumbly granules meant that a jumper’s takeoff foot moved, like on ball bearings, when planted. Jumpers approaching from the right side had an advantage in that their jumping surface was more intact…. An American W55 high jumper ranked in the World top ten decided to leave her job six months ago to train for the World Championships in Malaga. She paid her 200+ Euros entry fee, her round trip airfare from the USA to Malaga, rented an apartment for the duration of the event and paid for her food and incidental expenses. In total, a cost of approximately $4,000. Prior to arriving in Malaga, she had set an age group PR even though she is 59¾ years of age. All was set for her to test herself against other world class performers. Her high jump event was at the University track. As noted above, the jumping surface was rotten and dangerous. Even a Masters athlete generates several times his/her bodyweight at takeoff, but not when the force is being dissipated by a moving granular surface. She jumped well below any normal level of expectations. In a short, period of time her participation ended. Done. Game over. Maybe she just had a bad day. Most likely not. The facilities at that track, on that day, did not meet any kind of athletic or safety standard. For this athlete, the dollar per centimeter cost was high. But those financial costs paled by the emotional costs and the energy and commitment made in preparing for and participating in the Championships. She also injured her takeoff leg. Injury for the masters athlete are many times career ending or changing. Athletes have written similar complaint letters before. But this one appears among the most astute. And it includes suggestions for improvement, especially in oversight of LOC preparations. I look forward to hearing Margit’s response. What was YOUR experience at Malaga, especially in field event? Were all stadia the same? 4 Comments on "Florida M65 thrower rips Malaga facilities in letter to WMA President Margit Jungmann"
What to do when the LOC fails to do what it should do? WMA did checks of all stadia and they were not OK. So they came back later for another check. Still not OK. In the end some more or less cosmetical things were done and that should be OK according to the LOC… Should WMA cancel the meet? They should have a detailed inspection of the facilities before awarding the bid. The surfaces should be new or nearly new to be considered. Guy says the LOC should pay a financial price. Interesting article and summary of issues at Malaga. There is no doubt that the Mondo surface for the high jump, pole vault and javelin was an older surface tha that of the main track. It was definitely firmer than the surface across the rest of the facility, but I have to say that drawing a conclusion that the track was not adequate because of the individual performances of athletes is a long bow to draw. In our decathlon at Universiade, the pole vault and high jump performances were as, or better than, expected. Personally, my high jump was better than anything I’ve done in 15 years and more than one athlete PR’d in our vault. Watching the joy of an Irish heptathlete exceed expectations in her high jump lends further credence to this view and undermines the argument that one or two underachieving athletes justifies a sweeping statement about the track. Was the surface old, sure. Was it inadequate? Not at all – in my view.